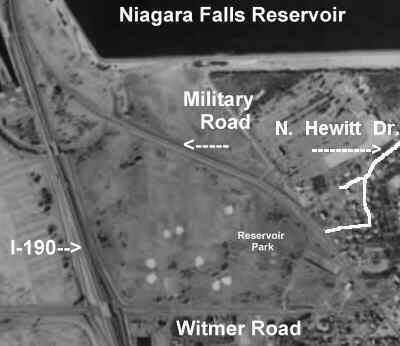 The Wing and Rotor flies at Reservoir Park, right on the boundary between Niagara Falls, NY, and Lewiston, NY. From the I-190, take exit 24 (Witmer Road, Route 31) east. In the morning, we park in the parking lot on Witmer Road and fly from the outfield of the two northenmost ball diamonds. In the evening, we park on Military Road and fly from the middle of the field, facing south. Here is a wide-angle view of the reservoir. These photographs are taken from the MicroSoft Terra Server. Dan Warner donated his Hobbico Hobbistar 60 as a camera plane. attached or detached relatively easily. The servo is fastened to a short piece of an aluminum yardstick with double-sided tape and some electrical wire. The aluminum is bolted to the bottom of the camera using the threads for a tripod and a short piece of 1/4 x 20 nylon bolt. The servo is actuated by the gear switch. I have attached a plywood/lite-ply "finger" to a servo wheel. I just kept fussing until hit hit the shutter release more or less in the center when I moved the gear switch. The camera is rubber-banded to 1/2" foam rubber. The foam rubber is glued to a piece of lite ply. The lite ply is attached to the side of the fuselage with three small nylon bolts run into pine blocks. The pine blocks are just lightly glued to the inside of the fuselage. The camera is centered on the plane's CG. By detaching the servo leads and taking out the three nylon bolts, the plane is ready to return to its primary mission as a trainer. The camera is auto-focus and auto-wind. I usually shoot 24 photos on one flight. Some photos turn out better than others. 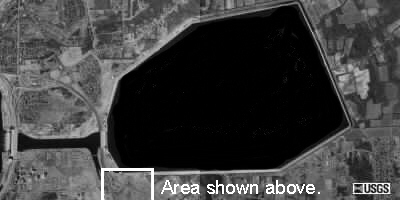 Military Road & Reservoir, east of field. Looking Northeast. Military Road in center. I-190 at left. I-190, southwest of the field. Niagara River in the distance. Eastern end of the Reservoir. I-190 North. Looking across Military Road at the southeastern corner of the Reservoir. Southwest corner of the field. I-190 and Witmer Road. Dan and I are in the foreground, taking pictures at FONRA 1999. Doug Webb is off on the right. Southwest corner of field. Military Road, looking South.